This past weekend we traveled to Pine Mountain, GA, to Callaway Gardens to attend the Masters Water Ski and Wakeboard Tournament presented by Nautique. Ambush Board Co. has been at this event for 20 years with a merch tent with one of the best views of the action on Robin Lake. Going into the weekend everyone was buzzing about what would the Pro Men’s Wakeboard podium end up looking like. We got to see a four man final of Tony Iacconi, Cory Teunissen, Harley Clifford, and Mike Dowdy, and it was absolutely mental! We predicted a Harley vs. Dowdy showdown and after seeing Cory crush it we knew it would be a toss-up because his run was mind-blowing. Alex and Cole produced one of the heaviest online videos of 2016. The video, “ALa-Crusin” was released in Orlando, FL for the 2016 Surf Expo inside the Alliance Wake booth. To date the video has over 5,700 views and is still the talk of the town. Take a peak at some of the never-before-seen footage and some super heavy spills and thrills. Space Rocket Shapes FTW. Also…go to BuyWake.com and check out what Justin is rocking with Humanoid Wake this season! Stars on the Water, Warriors in the Sun! What a weekend! 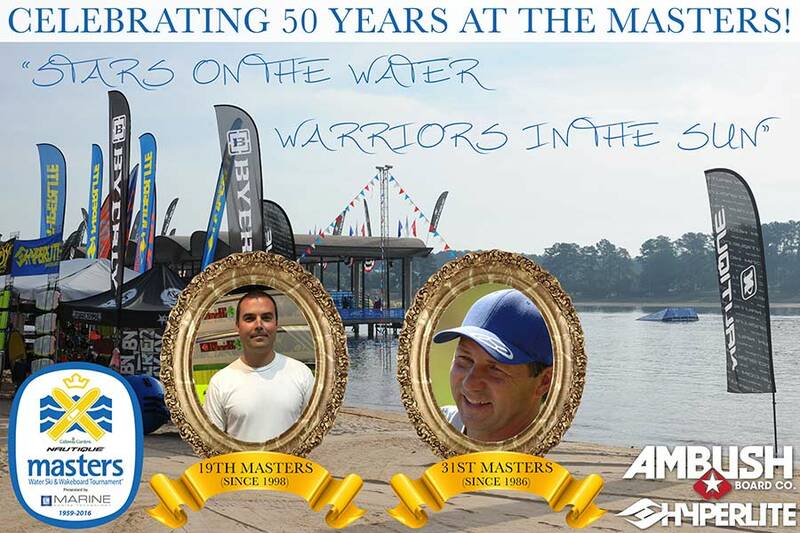 The 57th Nautique Masters Water Ski and Wakeboard Tournament was held at the prestigious Callaway Gardens on the legendary Robin Lake. This year was a special one for a few reasons, but…most notably, it was Lee Elliott’s 19th Masters and Eddie Beverly’s 31st! That’s a combined 50 years between the two of them! As a thank you, we whipped up this gem of a photo and presented it to them. Last updated by Rhett at May 30, 2017 .